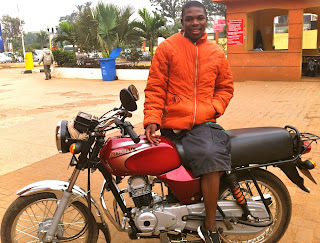 Bodaboda Baby: Two drinks. 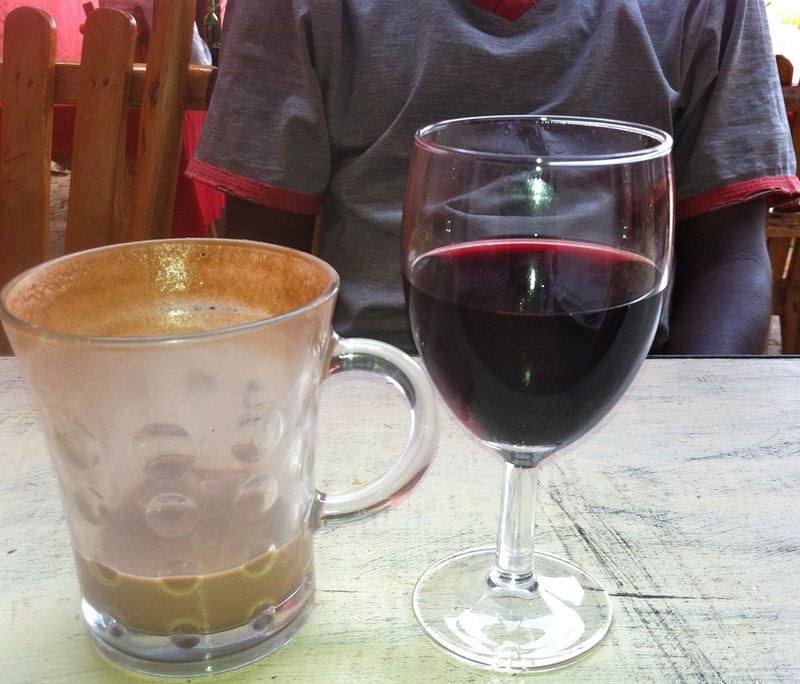 A hot choc & a glass of red. 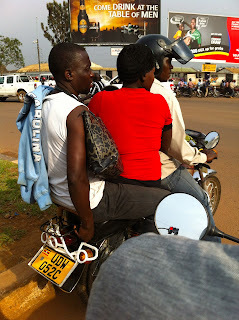 Guess which one the boda driver had? Two drinks. 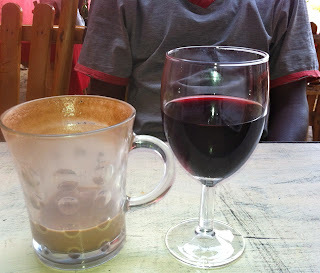 A hot choc & a glass of red. Guess which one the boda driver had? You may be surprised, but it seems that boda riders, Uganda's battle-hardened motorbike taxi boys, are actually partial to a glass of red every now and then. Well, at least if James is anything to go by. 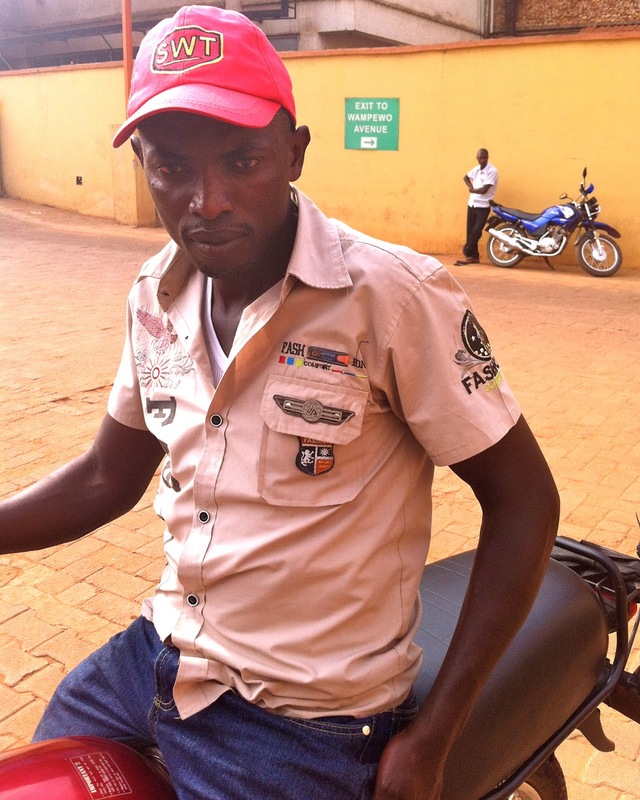 I met the 27-year-old driver of five years today outside his stage near Oasis Mall and he took me to Cafe Kawa, next to The Wine Garage at Muyenga, where we had a drink. (Okay, so his first choice was a Club, he spoke two other languages that weren't English and it's quite likely he had no idea what was going on, but he didn't say no when asked by Cafe Kawa waiter Paul if he wanted a vino). 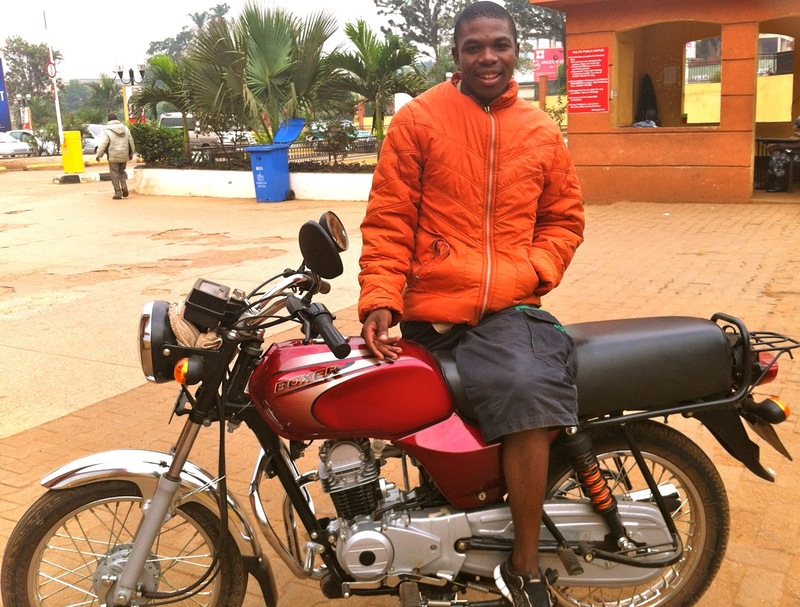 A new year, a new boda. Move over man-bag. If you think that was stylish, this chariot's got a (presumably faux, but you never know, he's had a good year he says) Louis Vuitton purse that he ties to his belt on a chain. 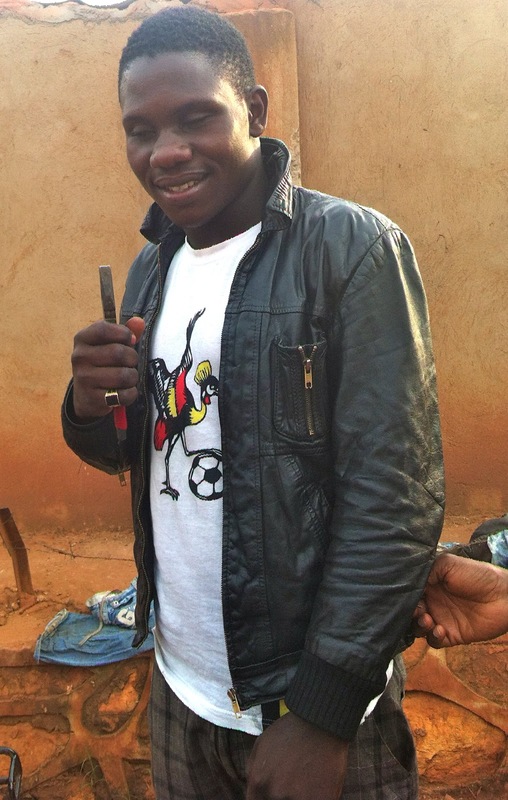 Over our drinks I asked James what the festive season had been like in Uganda. (Thanks to Paul from for translating. Oh, and hello to one of my readers Nigel Ball - I thought I saw you at Kawa but apparently it was your doppelgänger). 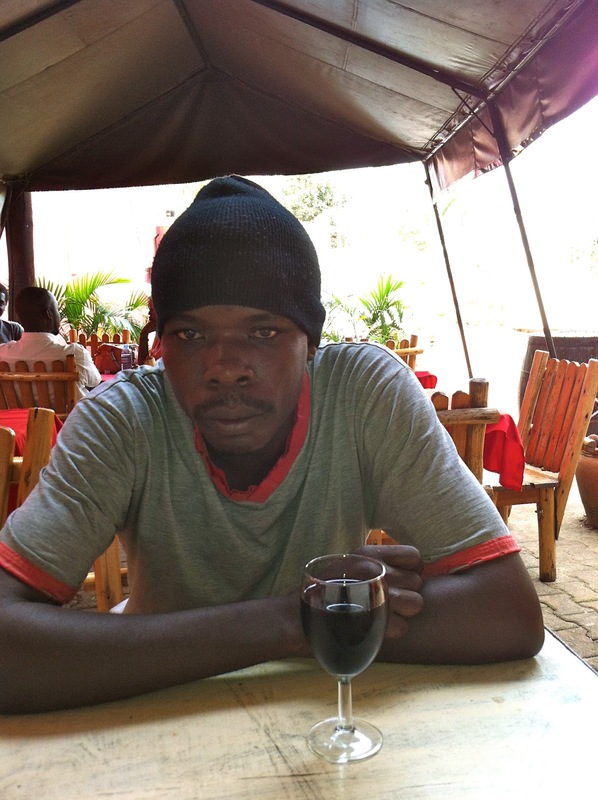 James enjoying his drink at Cafe Kawa, next to the Wine Garage at Muyenga. Do boda drivers normally drink wine? Paul (adding his own comment): Of course, that one is automatic! James: Once in a while I can take sweet wine. I take also beer but on the weekend when I'm relaxing. On the road. Ummn, helmet ploise! Did you work over Christmas? Mzungus (foreigners - James' bread and butter) normally go home and take a long time with their mum and dad, so I went to my village Rukungira (western Uganda). I've just come back from holiday there. I hadn't been home for six months. My parents were waiting for me because I'm the one who's financially stable. 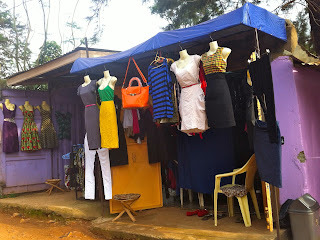 So when I reached there I bought clothes for my mum, my siblings and my dad as presents. I went by bus and left the bodaboda this side (in Kampala). I wasn't working during that period. I was just there for celebrations. 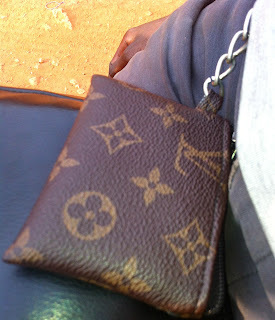 Fake LV from local Owino markets for 20,000 UGX ($7.38 USD). 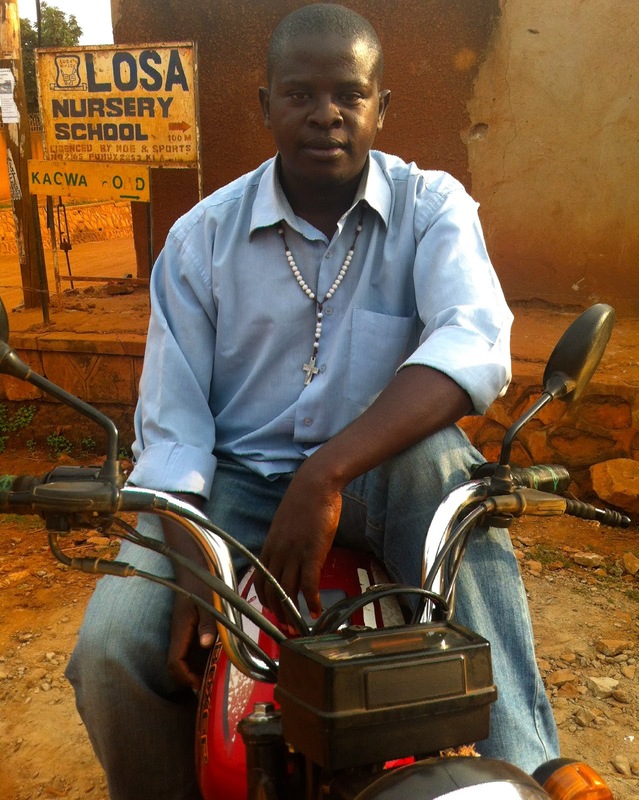 Do you like driving bodas? I like it because I get food, rent, everything. It's my source of income. Nike's from local Owino market, which cost 20,000 UGX. Why are you wearing a beanie, despite it being so muggy? 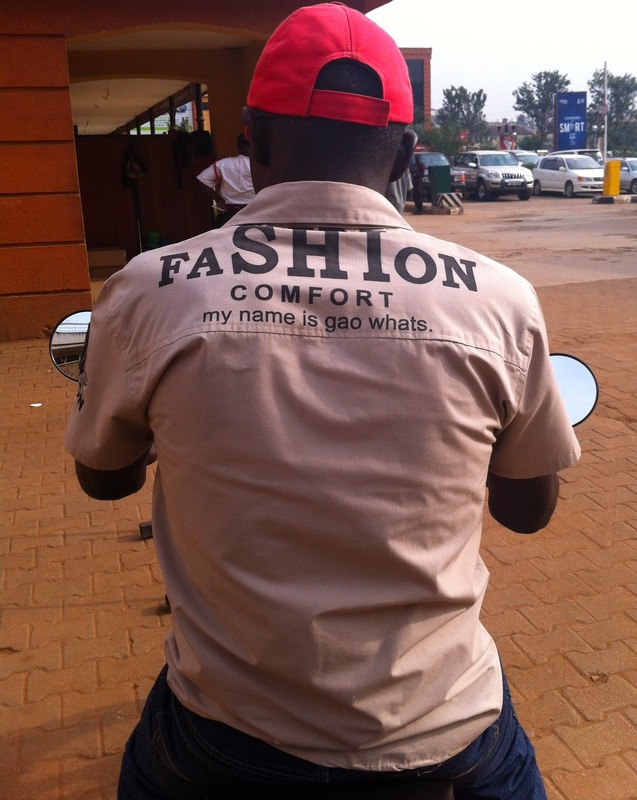 It's not fashion. One reason is because the dust won't enter. At times of driving without it I can get a headache. I don't get hot wearing it. I'm used to it. 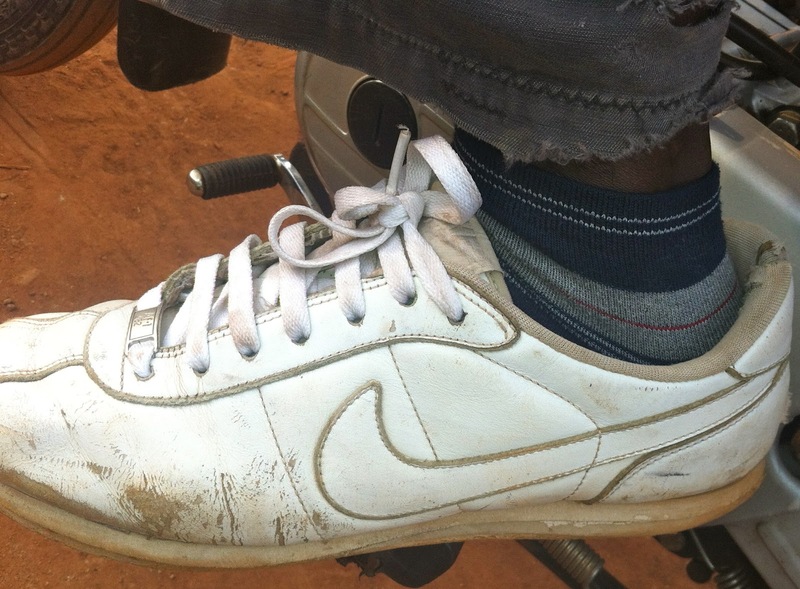 It cost 5,000 Ugandan shillings ($1.85 USD) from Owino market. 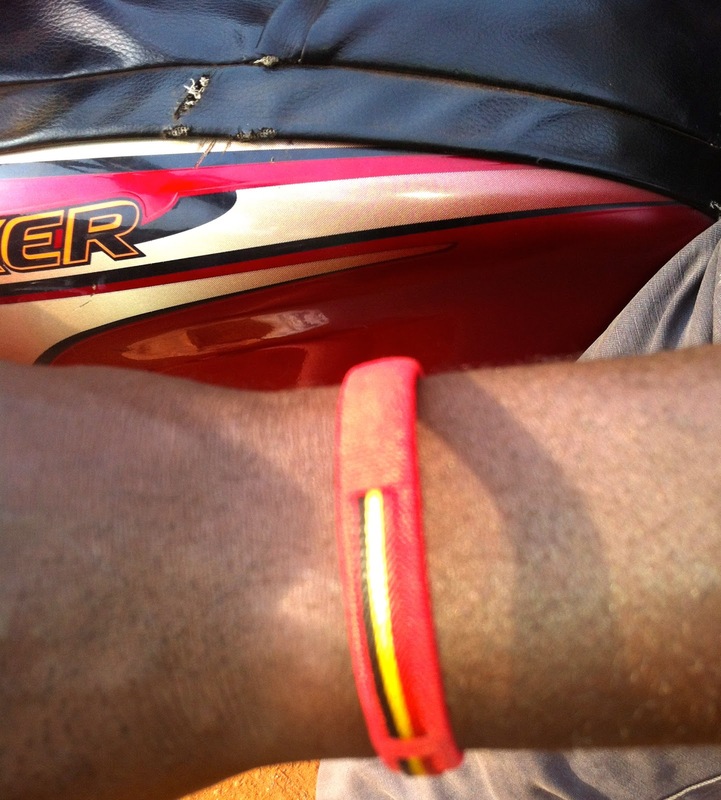 The ubiquitous Uganda flag wristband. V patriotic. We're early into the new year. Are you getting a lot of customers? Compared to the Christmas season where people were going back to their home and their countries, it's good. Now people are working normally. First of all I've started building a house in the village. It's not yet accomplished so I'm expecting by the end of this year it will be. Secondly, if God's willing, I will marry and start having children. A family out and about on a boda in downtown Kampala today. You can't see it, but there's also a baby onboard! 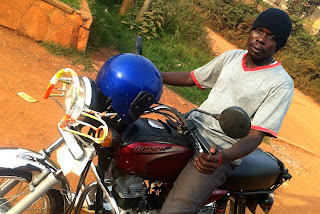 My first boda of the day was a golden oldie, Dennis, from the cottage next door to our house (post on him coming soon but see pic below). He was very concerned that in the shot below he's wearing the same orange jacket that he was sporting in the previous pic I'd taken of him (yet to be published), so just to assure readers Dennis has a varied wardrobe and wouldn't dream of stepping out in the same outfit two days in a row. Nice shirt. But what's the meaning? He was followed by Albert, 30, a newbie, who I picked up off Kira Road at Kamwokya and was wearing a red baseball cap and an interesting shirt button-up shirt that said FASHION COMFORT my name is gao whats. Meet Albert, a new driver. Then there was a favorite, Julian, whose main accessory is rosary beads. He took me to Munyonyo. When I hailed him, Julian was hanging out with some other regulars, including Frank. One driver I didn't know, Henry, was dressed in a black leather bomber jacket and carrying a pair of pliers (presumably he had mechanical problems). Julian, a regular driver, loves saying his Hail Marys. From left to right: Unknown, Henry and Frank. Playing around with some pliers and managing to look so stylish at the same time. Now that's multi-tasking. Oh, and for anyone who wonders whether James got me home safely (MUM! ), he did. I even stopped at the shops on the way home. I'm pleased to note that in 2013 there's still some great bargains to be found on the dusty Ugandan roadside, including this Australian-inspired green and yellow number below. Should I buy the green and gold outfit and fly the flag for Down Under in Africa? Yes? ?